Couchsurfing helped me find a home and make new friends in New Orleans. NEW ORLEANS – Looks like I should have paid that street magician who promised to fix the game with a spell, but though the Niners lost the Super Bowl, the Big Easy delivered me a lesson in Southern hospitality. When the chance to cover the Super Bowl arose, I tried to channel Colin Kaepernick sprinting for the end zone as I raced to accept. The only question was how to crash pro football’s greatest party without breaking the bank. Last-minute airfare ran $1,500, but I managed to trade in airline miles for a ticket to nearby Mobile, Alabama (even that required more account credit than a trip to Europe). The cheapest game tickets sold for $2,000, and some for more than $12,000, but a media pass would get me in the Super Dome door for no charge. Mardi Gras flooded the city with visitors. That left just the problem of lodging, always a challenge in Super Bowl week, especially when it overlaps Mardi Gras in New Orleans. A fellow journalist warned I would “hit a brick wall” in pursuit of a room, and early efforts proved him right. The only option I found for less than four figures was a bunk bed in a hostel dorm for $100 per night, and even that disappeared before I could take it. Then an unlikely break arrived through a web site called couchsurfing.org, home of couchsurfers, friendly folks around the world who travel and host travelers in their homes for no charge. My brother recommended it so I made an account and sent requests to 30 hosts in New Orleans. A fireman named Matt replied. “Stay here,” he offered. “Feel free to come and go as you please and make yourself at home.” I accepted his gracious offer and took off for the Crescent City. About a billion dollars changed hands over this game; I pulled off the trip for $300. 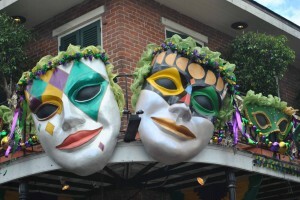 My first visit to New Orleans came during a post-high school road trip I took with two buddies. Wild, loud and exciting, the Big Easy supplied the favorite experience of three 18-year-olds on a coast-to-coast journey of discovery. Three years later I returned as a collegiate journalism student and distance runner attending the U.S. Olympic Track and Field Trials as a reporter. The outing provided great fun and helped me develop professionally. After hours in the French Quarter, I learned the hard way not to play drinking games against pretty girls in bars. 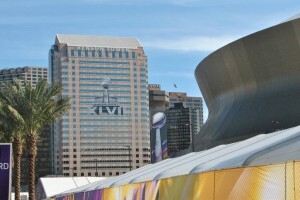 The Super Bowl showed both the Forty-Niners’ strengths and weaknesses. That was my last visit until Super Bowl XVLII, which demonstrated some other things we already knew or should have known. The 2012 Niners were capable of fantastic exploits and catastrophic mistakes. Kaepernick is San Francisco’s quarterback of the future; he’ll play on this stage again. Another lesson might be that “officiating is part of the game.” The non-calls against the Ravens in the game’s final minutes appear to be not just questionable but clearly wrong. Without the officiating lapses, the red and gold would likely have won. Yet the Niners benefited from a similar non-call late in the NFC title game against Atlanta and San Francisco accepted the Super Bowl berth anyway. Complaining won’t bring the trophy home; the Niners and their fans had might as well let it go. A final lesson took me by surprise. As a high school teacher, I instruct students in slavery, the Civil War and segregation every year. Though I hadn’t set foot there for two decades, I came to associate the South with intolerance. The many road names and monuments I spotted honoring Jefferson Davis and other Confederates (pro-slavery traitors, in my view) didn’t shake this prejudice. Entertainment at the House of Yes includes front-yard bonfires and shared bottles. My stay with locals did, though. “Who dat! Who dat! Who dat say dey gonna beat dem Saints!” Football fans here still curse San Francisco for edging New Orleans in an epic 2012 playoff game, but Matt and roommates Rachael, Jeff and Ken warmly welcomed me, a perfect stranger, and I wasn’t the only one. They call their home the “House of Yes” for good reason as they seem to say yes to everyone who asks to stay there. A deliriously happy Ravens fan, an Italian doctor and five young women from Florida also shared living space during my visit. 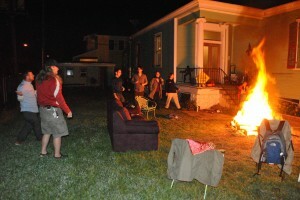 Late at night, the hosts build bonfires in the yard and pass around bottles to their guests. While a Forty-Niners championship would have been nice, I think I won a greater prize by rediscovering a fantastic city and making new friends.